A north-east MP has backed a local campaign to restore a crumbling school in Torry. Aberdeen South MP Ross Thomson has now urged city councillors to allow the community to purchase a historic former school site. Mr Thomson made his intervention prior to tomorrow’s council meeting to decide the fate of the Victoria Road school. The building has been empty since 2008, with previous plans for a private housing scheme falling through in 2017 after planning permission was refused. Councillors agreed in March to put the site on the market, with the aim of retaining the original granite school buildings. This was greeted with dismay by Torry residents who had been arguing the case for community ownership of the building. Members of the Torry Development Trust subsequently held talks with the local authority to take control of the property and transform it into affordable housing. Mr Thomson said: “I have followed the efforts of the local community in Torry to take control of this site for some time now. “I think the group has made a very compelling case and I would urge all members of the committee to support their plans for this historic site. “There has been a great deal of debate about the nature of development in Aberdeen in recent years, but I think everyone can agree we need to do all we can to retain our granite heritage. “We have lost too many beautiful granite buildings like Victoria Road school, and it would be a real loss if it were to be knocked down. 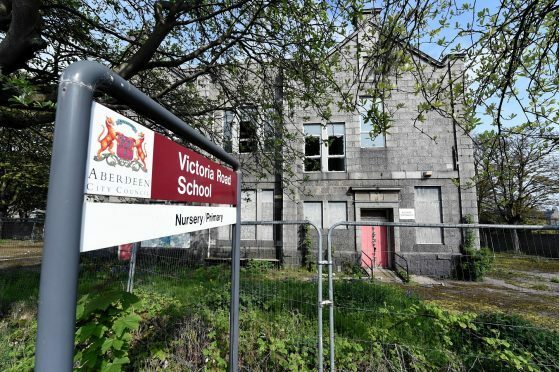 The Torry Development Trust recently enlisted the help of heritage consultant Ian Davidson, who agrees that Victoria Road School should be restored rather than destroyed. He said: “I think it would be an absolute tragedy if this place was completely lost. It needs to be protected and continue to serve the community in which it sits. Members of the council’s city growth and resources committee will consider a report on the disposal of the site tomorrow. Victoria Road School has long been an essential part of the Torry community. The school was built in 1878 after the Fisherman’s Association of Old Torry agreed to pay £1,400 towards the costs. It opened on May 2 of that year and was named Torry Public School, with Mr William Yunnie appointed as its first headmaster. According to records he had the “unenviable task” of teaching all 100 pupils in the “main room”. Early improvements made to the school building were down to a mysterious but clearly generous Mrs Angus, who appears in records from the earliest days of the school. She was asked to support education in the community and help the Torry Public School and was able to use her influence to successfully persuade members of the school board to bring extra funds to improve the building. Heritage consultant Ian Davidson described Mrs Angus as “One of the great early heroes of education in the Torry area”. In 1905, the old Abbey Road school was extended considerably, at a cost of £8,700, and renamed Victoria Road Primary School. This was much down to the work of another female pioneer for local education – Elizabeth Nesbitt. In both 1878 and 1904 she oversaw extensions to improve the building while also acting as head teacher. In the following years, Victoria Road School was successfully used as a base by the Army during the First World War. During The Second World War, meanwhile, the main body of the school was hit by a shell during a bombing raid, causing massive damage. The community rallied together to repair the school and it continued to serve the Torry community until its closure in 2008.